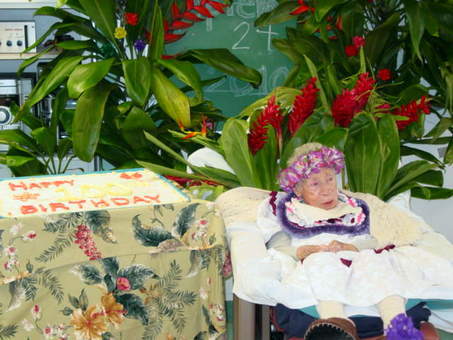 Honolulu, Hawaii — On Friday, September 24, 2010, Maluhia, as part of National Adult Day Services Week recognized one of its oldest participants (nursing-home out patients). The staff honored Mrs. Isabel Feldman, who turned 100 years old on September 30. Isabel (“Bella” Pastor) Feldman was born in Brooklyn, New York, on September 30, 1910. She spent most of her childhood on the East Coast, and married Leon Feldman in 1934. Four years later her first son Allen was born followed four years later by Jay. Mrs. Feldman has three grandchildren, three great children, and one great grandchild. Leon and Isabel Feldman arrived on Oahu for a visit in the early ’90s and decided to make it their new retirement home. Sadly, Mr. Feldman died in 1996, and son Jay moved in to help Isabel. As Mrs. Feldman aged, her son Jay’s care giving evolved quickly from part time to fulltime following a broken hip incident and the onset of vascular dementia. In 2001, Mrs. Feldman moved to the Weinberg Assisted Living Accommodation at Maluhia, and eventually entered the PACE program of Maluhia in 2003. At the present time, Mrs. Feldman requires complete care and most of the daytime obligation is provided by the staff at Maluhia Adult Day Health. Her son cares for her at home during the evenings and nights. Mrs. Feldman’s medical care is provided by the in-house Clinic at Maluhia staffed by a physician and registered nurse. During the birthday celebration Mr. Jay Feldman thanked the staff of the MADHC for responding to health care the needs the adult day health outpatients. At the same time, Linda Hamada, R.N., of the Maluhia Clinic, on behalf of the hospital staff, recognized Mr. Jay Feldman for his outstanding role as a dedicated family member and caregiver.